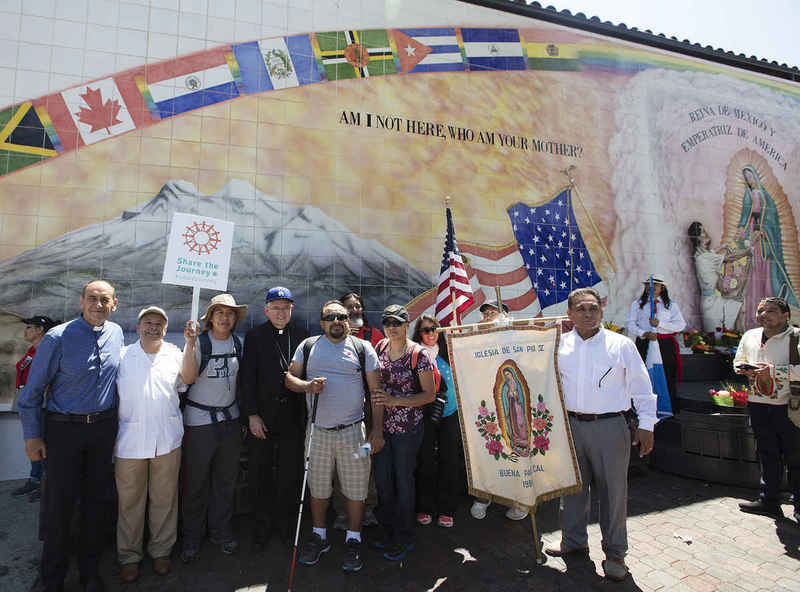 On Sunday, June 24, Archbishop José H. Gomez addressed a crowd of more than 3,000 at the Cathedral of Our Lady of the Angels during the Mass for All Immigrants. His homily was delivered in Spanish and English, and is adapted here. America has always been exceptional in the family of nations because from the beginning, this was not a nation defined by territory or by a specific race or people. America, from the beginning, was about a dream. We all know that beautiful Latin expression, “e pluribus unum.” “Out of many” races, languages, traditions and beliefs — we form one nation, one family. All of us children of God. This is also a special day in the Catholic Church, because today is the “birthday” of St. John the Baptist. Our first reading today describes the birth of the prophet Isaiah, and the second speaks of Abraham’s children and the descendants of David. Finally, the Gospel tells us the drama that surrounded the birth of John the Baptist. In the Church, we are God’s people, his family. And he gives us the duty to take care of one another. He calls us to speak out against injustice, to make things right when they are wrong. Migrants and refugees built America and they are still making this country great. And the truth is that America needs more immigrants, not fewer. My brothers and sisters, our country needs you. America needs your immigrant spirit of hard work and faith in God. We need your spirit of self-sacrifice and the way you place the highest value on your children and families. “What, then, will this child be?” For surely the hand of the Lord was with him. The child grew and became strong in spirit, and he was in the desert until the day of his manifestation to Israel. And in this moment when we are so worried about these children that our government has taken from their parents, we need to remember that they are children of God and that he is with them always. We need to pray that they will be treated with mercy and compassion. And we need to work hard so that these little ones will be set free and reunited with their parents, so together they can dream the American dream and do great things in this country. And there are nearly 2 million more children who have been living inside our borders for almost their entire lives. Some are now in their 20s and 30s. They are “Dreamers,” too. And my brothers and sisters, we need to help set them free, too. For years now, we have been asking our leaders to fix our broken immigration system. Year after year, they keep telling us, “Mañana, mañana.” Next year. It makes no difference which political party is in power, there is always some excuse. Brothers and sisters, we need to tell our leaders — no more “mañanas,” no more excuses. The time is now. This bill has broad bipartisan support. It would permanently protect the “Dreamers” from deportation and provide them a path to become citizens. It would also strengthen security along our nation’s borders. May our Blessed Mother be near to every child and every parent suffering separation along our borders this day. And may she help every one of us to share in the dream of America.